How does the excel clipboars work? 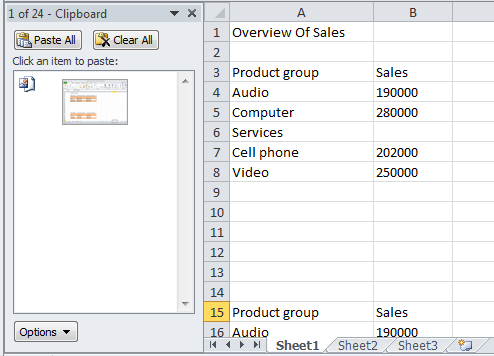 When you copy or cut objects, they are added to the excel clipboard. Typically the last item added to the clipboard is pasted. You can, however, also access and paste items previously copied or cut to the excel clipboard. In this learning module you will learn how to use the excel clipboard and what settings you can apply to it. HOW DOES EXCEL CLIPBOARD WORK? The clipboard is one of Windows’ storage facilities. Every active programme can access it, temporarily store data on it, and then use the data again. 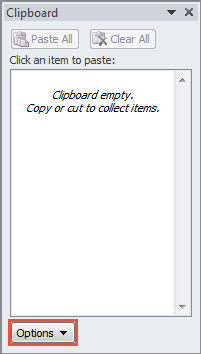 The Windows clipboard can only hold one item at any one time. If another item is added to the clipboard, the previous one is lost. For this reason Microsoft Office now has its own clipboard with the capacity to hold 24 items. In other words, you can collect 24 items on this clipboard. The item last added to the clipboard will also be added to the Windows clipboard and can therefore be accessed by programs that do not belong to the Microsoft Office suite. You will find all commands relating to the use of the excel clipboard in the Clipboard group on the Home tab. Next to the excel Clipboard group label you will find the Dialog Box Launcher . If you click here, the Clipboard task pane will open. In the excel clipboard you will find 24 of the items most recently copied or moved. As all Office programs have access to the clipboard, you will find – not only parts of an Excel table – but all sorts of items, such as extracts from a Word document, pictures, etc. With the two buttons at the top of the clipboard you have the option of pasting all items in the clipboard into the table or clearing all items currently in the clipboard . When you hover with the mouse over an item in the clipboard, a border containing an arrow is displayed next to the item. If you click on the arrow, a menu will open in which you are able to choose between the two commands . Paste will insert the respective item into the document. Delete will remove the item from the clipboard. You can therefore make room for new items or keep older items in the clipboard. Close the excel clipboard by clicking on Close in the top right corner. You can therefore use the excel Clipboard task pane to insert items most recently added to the clipboard into your document. In the Clipboard task pane you can also apply settings to control when to automatically display the clipboard. Click to do this . Show Office Clipboard Automatically. 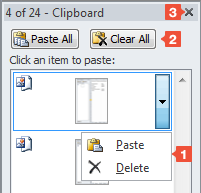 If this option is activated, the Clipboard will open automatically when you open a new document. This function also automatically activates option two, Show Office Clipboard When Ctrl+C Pressed Twice. Show Office Clipboard When Ctrl+C Pressed Twice. If this function is activated, the Clipboard will open when you press [Ctrl]+[C] twice. This option is automatically selected together with the Show Office Clipboard Automatically function. The second option cannot be disabled if the first function has been activated. However, if the first function is disabled, the second option can be either turned on or off. Collect Without Showing Office Clipboard. With this option you can copy several items to the clipboard without displaying the Clipboard dialog box. To still keep track of the status of the clipboard, you should activate option four, Show Office Clipboard Icon on Taskbar. Show Office Clipboard Icon on Taskbar. With this option the clipboard is displayed with the icon in the taskbar at the bottom right corner of the screen, giving you quick access to the items on the clipboard. 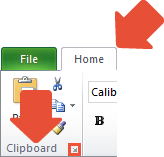 If you close the Clipboard dialog box, the icon will also disappear from the taskbar. You need to activate options three and four if you want to also show the icon in the taskbar when the excel Clipboard dialog box is closed. Show Status Near Taskbar When Copying. This option will activate an additional display function that will let you know how many items are on the excel clipboard while you copy. The message will appear for a few seconds, after which it will disappear again. If you hover with the mouse over the icon on the taskbar at the bottom right of the screen, you can also see how many items are currently on the clipboard. If you right-click on the icon, a menu containing the functions of the excel Clipboard dialog box opens. Excel will check if there is already an identical item on the clipboard. If this is the case, the item will not be copied.